A unit package is a pre-defined order of battle for a company or platoon organization. The ATF Scenario Builder contains pre-defined packages for just about every kind of heavy US and FSU (Former Soviet Union) task organization imaginable, from Attack Aviation Companies to Engineer Platoons. This prevents you from having to manually create platoons and companies, one unit at a time. Of course, not every possible organization is defined. Sometimes you will have to build hierarchies from scratch. But the Unit Package can definitely give you a head start. 1. Select 'Friendly' from the 'Add Package' sub-menu of the 'Unit' menu. 2. Select the type of unit package you wish to add. 3. If you select a company, you will be prompted to give a company name. 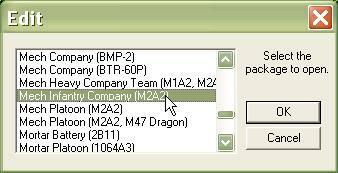 If you select a platoon, you will be prompted to give a platoon and company name. 4. Enter a name. This company name will be applied to every unit and hierarchy in the package. 5. You will also be prompted to add a battalion and regimental name. 6. Enter a name. Again, this will be added to every unit and hierarchy. 7. 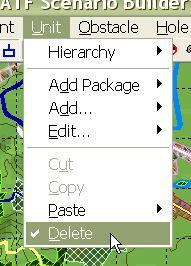 When you move the cursor down to the map, you will find that you are 'dragging' a line of units and hierarchies. 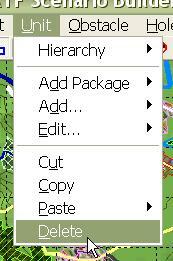 Left-click anywhere on the map to 'drop' these units and hierarchies where you want them. The process for adding an Enemy Unit Package is exactly the same except that, initially, you select 'Enemy' from the 'Add Package' sub-menu of the 'Unit' menu. 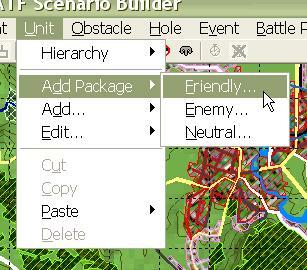 In creating the friendly order of battle that you want, you may find that you need to remove some units and hierarchies added either manually or while adding a Unit Package. This is an even simpler process then adding units! 1. Select the units and/or hierarchies you wish to delete, either by shift-clicking on them, clicking on them, or drag-clicking over them. 2. Select 'Delete' from the 'Unit' menu. 3. 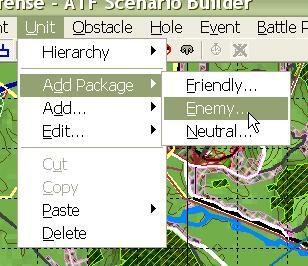 The ATF Scenario Builder will ask you if you are sure you want to delete the units. If you are, select 'Yes'. 4. While the 'Delete' function is active, any unit or hierarchy you click on will be selected for deletion. When you are done deleting units, make sure you select 'Delete' from the 'Unit' menu (or 'Esc') to turn it off.